The Triangle, a six-story, 195-unit apartment community in downtown Redmond, WA, has officially opened to the public. The residential project, a development of Legacy Parters, is located at 16450 Redmond Way. 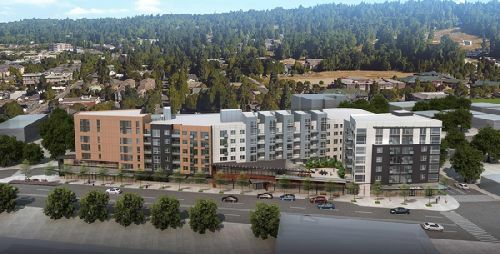 Situated on a triangular lot at the intersection of Redmond Way, 166th Ave NE and NE 79th Street, this multifamily, mixed-use building designed by Tiscareno Associates will feature a mix of one- and two-bedroom apartments, lofts, and live/work units, plus 9.5k sf of amenities, 195 parking stalls, and 4.8k sf of retail space. Situated between the neighborhoods of Old Town and Anderson Park, The Triangle is just blocks from Redmond Town Center and Trader Joe’s, as well as dozens of restaurants and cafés. The building is only three blocks from the future light rail station. The Triangle is part of the City’s Downtown Couplet Conversion Project, which aims to create a more user-friendly downtown for cars, bikes, and pedestrians by converting Redmond Way and Cleveland Street to two-way streets, further enhancing the thoroughfare.